Here is the Gillespie quintet in France in 1965. Dizzy introduces the members. Moody flutes the blues. Moody was not only one of my favorite players, but one of the nicest men I met in my time on the circuit marketing brass instruments. I would see him at NAAM, or the old IAJE shows, and sometimes in a random place (his 80th birthday was celebrated at SUNY Purchase in a hall adjacent to one of Allan Colin’s Brass Conferences). He was warm, funny and engaging – and had a nice word for everyone. I miss hearing many of my heroes who have left us, but I miss seeing Moody. He was an original in so many ways. Thanks for posting. Wow! Great clip. Moody was absolutely brilliant! And Diz — one of a kind and funny as ever. Thanks! 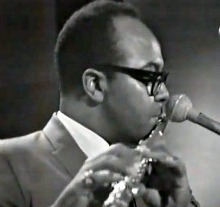 James Moody was a terrific flutist and a great guy as well. A lot of guys doubled on flute including Bud Shank, Dolphy and my personal favorite, Yusef Lateef. May all of them rest in peace. The piece heard in the video clip is actually Moody’s “Darben the Redd Foxx,” a tribute to the comedian heard on Moody’s eponymous 1959 Argo album. Speaking of foxes, Dizzy was known to assign tunes ad hoc titles. That was certainly the case with “Mmm Hmm.” He would also occasionally give a friend in the audience composition credit for one of his own tunes.